Digital Asset, the DLT (distributed ledger technology) provider, has entered into a collaboration with the ISDA (International Swaps and Derivatives Association) for the development of a tool that will support the use of smart contracts in the trading of derivatives. The news was made public by the ISDA on April 9 via a press release. The collaboration will focus on developing technical solutions related to interoperability that will facilitate standardization using Digital Asset’s proprietary modelling language for smart contracts. This in turn will allow for a greater degree of automation in the management of derivatives trading. The world’s most popular YouTuber in terms of subscriber number, PewDiePie has joined DLive, the Blockchain-powered live streaming platform. PewDiePie, whose real name is Felix Kjellberg, is a 29-year-old content creator and has now signed an exclusive live-streaming contract with DLive. PewDiePie’s YouTube channel has more than 93.7 million subscribers. His latest video chalked up 4 million views in less than 24 hours. Now, from April 14 onwards, the YouTuber will live-stream once a week on DLive, which is a decentralized community that has been built on the Lino Blockchain. PewDiePie stated on his new DLive channel that he would donate as much as $50,000 to support content creators. The CVA (Crypto Valley Association) has been undergoing a major restructuring. On January 31 earlier this year, the CVA’s General Assembly had elected Daniel Haudenschild, former Swisscom manager, as the new president of the Association. He replaced the previous president, Oliver Bussman. Bussman, along with other members of the Association, had announced in November that he would not be running for re-election during the next General Assembly. Bussman, who runs a consulting company in Zug, as well as some other members had been accused of using the Association for personal business. The other members accused were Kevin Lally, Mattia Rattagi, Kamales Lardi and Martin Berweger, who were also replaced during the General Assembly. The capitalization of the digital asset market is now at $181.98 billion. Trading volumes have currently reached $48.46 billion. Up 0.91%, the price of Bitcoin is now $5246.71, and the valuation of the asset in the market is now $92.53 billion. The crypto is facing volumes in trade of $13.71 billion. Up 1.74%, the price of ETH is $179.98. Capitalization of the digital asset is now $19 billion and trading volumes are $7.19 billion. Most of the top cryptos are trading up, with EOS showing the highest gains with a 5.55% increase in its token price. Cardano is up by 3.83% and Binance Coin has gained 2.12%. Stellar is down by 0.20%, and Tether has dropped 0.18% in its token price. Bitcoin’s trading at $5246.71, up 0.91%. 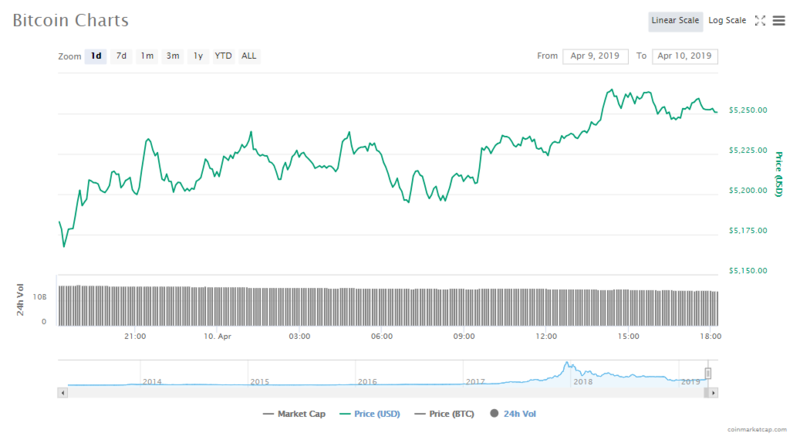 At the moment, the crypto’s value in the market is $92.53 billion. Ethereum’s trading at $179.98, up 1.74%. At the moment, the crypto’s value in the market is $19 billion. Ripple’s trading at $0.356097, up 1.52%. At the moment, the crypto’s value in the market is $14.88 billion. Litecoin’s trading at $87.68, up 0.61%. At the moment, the crypto’s value in the market is $5.37 billion. Bitcoin Cash’s trading at $300.27, up 0.56%. At the moment, the crypto’s value in the market is $5.32 billion. EOS’s trading at $5.79, up 5.55%. At the moment, the crypto’s value in the market is $5.24 billion. Binance Coin’s trading at $18.53, up 2.12%. At the moment, the crypto’s value in the market is $2.61 billion. Stellar’s trading at $0.125763, down 0.20%. 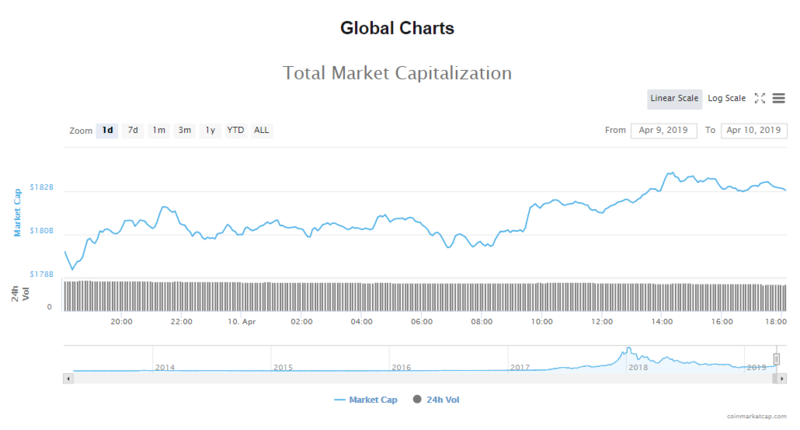 At the moment, the crypto’s value in the market is $2.42 billion. 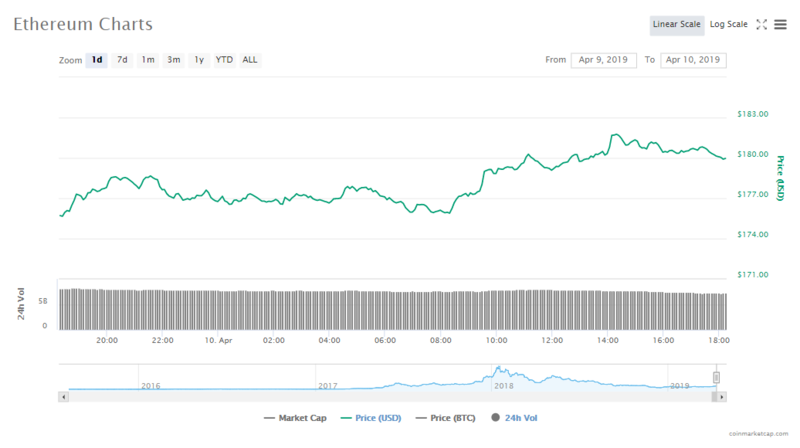 Cardano’s trading at $0.087008, up 3.83%. At the moment, the crypto’s value in the market is $2.25 billion. Tether’s trading at $1.01, down 0.18%. At the moment, the crypto’s value in the market is $2.21 billion. Two of the top ten cryptocurrencies by market value are now trading at their lowest levels in the last one year. Ethereum (ETH) is currently trading (at the time of writing) at $228.77, down by 19.64% in the last 24 hours. This is world’s second largest crypto’s biggest drop in one year. The last time ETH traded so low was on July 30, 2017.